Dreamed of converting your basement into a Star Trek mancave (or womanlcave). Well one Trek fan has sunk half a million dollars into that endeavor. See the results below, plus find out how you can buy a mansion with yet another Star Trek bridge replica and more built in. 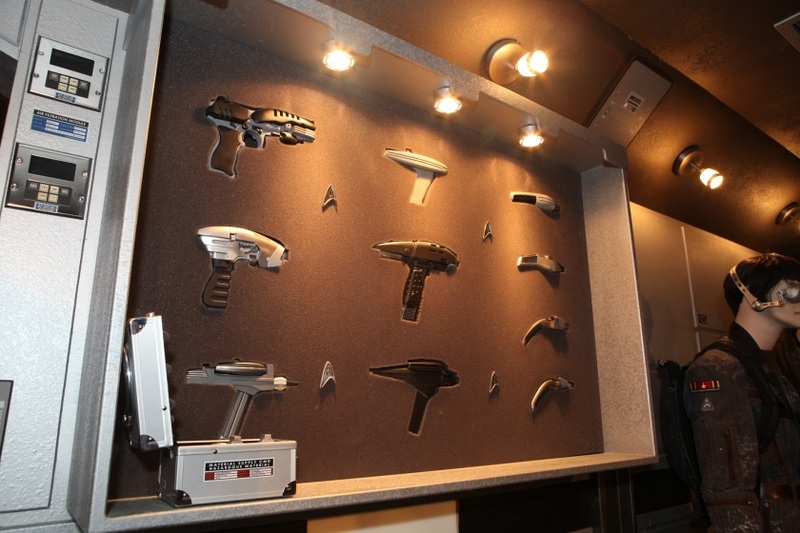 New York Trekkie Anthony Sforza has transformed his basement into a Star Trek wonderland. The 48 year-old married father says it took him three years and 1,500 man hours to turn his basement into a replica of a Star Trek set and fill it with memorabilia and collectibles valued at over $500,000. His ‘bridge’ viewing room is modeled on the USS Enterprise NX-01. He started with an original set piece bought from auction and matched the exact paint and materials. Below is a video tour of Sforza’s Star Trek basement (via Barcroft Media). 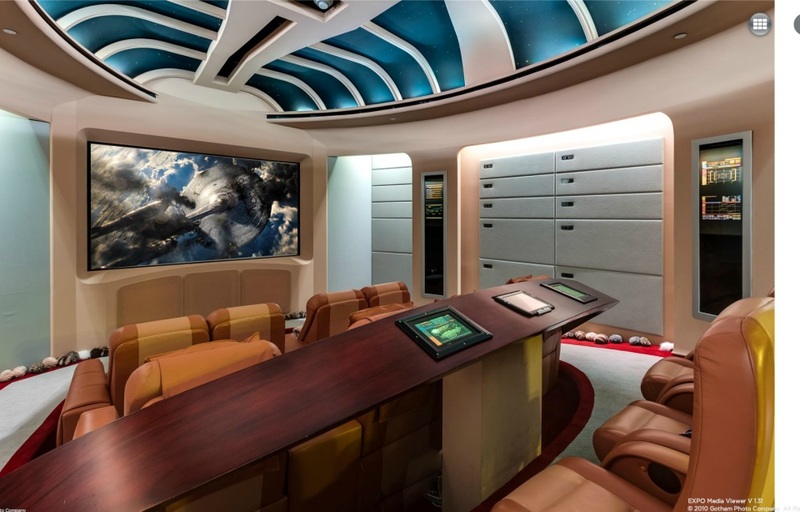 While Sforza’s Star Trek basement is impressive, it may be eclipsed by the Trekified rooms in a 27,000 square foot mansion in Boca Raton, Florida, which went on the market in May. Venture capitalist (and Star Trek fan) Mark Bell is moving to Miami and has put his Boca mansion up for sale for a mere $35 million. In addition to the full-sized basketball court and 1,500-bottle wine cellar, the home also features a replica of the USS Enterprise D bridge and two other Star Trek-inspired rooms, all filled with Star Trek and sci-fi memorabelia. Florida’s WPTV took a tour of the mansion, watch the report below. More photos of Florida mansion’s Star Trek themed rooms. If you want to buy the mansion, see the official realtor listing. Hmmmmm………FANATIC plus MONEY equals……..over the top squared? Hmm…is it me or ? I don’t see anything that I’d want. Some quality is there but nothing really stands out. 1/2 million dollars? Maybe half that – perhaps. You are correct its ok and clearly way too much money was spent on the wall of action figures. And who knows how much he wasted on the Nemesis stuff. I can say though that I would like the Nomad in there. be transformed into No More…. I’ll be interested in a follow-up story if and when he sells that house—to whom, for how much, is the new owner a Trekkie, and does the new owner keep the Trek mods intact or rip them out. Now that’s living the dream! It can only ever be for a limited time only though… before real life brings us crashing back to Earth, like a saucer crashing into Veridian III. “Nothing here matters” as Kirk might say. Interesting but kind of missing the point – they didn’t recreate a specific set or crew quarters or anything, they just threw up some wall panels and paint to look similar. Even the bridge one is noticably different than the real deal. Interesting to look at but meh. LOOK I’M RICH I MADE sorta STAR TREK IN MY HOUSE! YAY! If I had the money, and the means, I would build an EXACT replica of the TOS bridge and use it to watch movies and shows. Same design, same sound effects and lighting (turned off during movie-watching, of course), with no unnecessary clutter or add-ons. These variations and mixes-and-matches of different eras and designs doesn’t work, and will prove a hard sell. I suspect the current owners will have to spend a lot of money removing it all and restoring their homes to their original appearance. TV News + Trek = DUMB. Crappiest transporter effect ever. Twice. Hey, it’s good to be rich and a Trekkie. I’d settle for 30 minutes in there with the real estate lady. happen again…Here’s a tall frosty…slides a cold brew down the bar. The hell is with the amazingly annoying text that keeps appearing at the bottom of the first video? Let’s see…..the guy could either spend $500,000 dating and bedding the hottest women on the planet, or he could build this monument to a favored memory………. Harry, Or he could spend that kind of money sending kids to college. Egad. I am the only person who was annoyed by the reporter using “lightyear” to describe time and not distance? Well, when you have that kind of money, you tend to do what you want – I liked it. No it is not even close to an exact replica – but it is “fascinating”. More than I’ll ever be able to do – unless I hit the lottery. Its his money, he can do anything he wants with it. Its actually not any of our business. P.S. I still self-identify as a Trekkie because it’s the term I grew up with and I like the sound of it better. Trekker sounds too self-serious. P.P.S. And you’re right. His monument to his own fandom could certainly have been better spent funding Trek fan films. Calls himself a Trekkie. Writes “Nemoy” under the ears. Its his money and he can do what he wants with it. Thats a pretty slippery slope you going down. Money does not equal Intelligence, common sense or a good idea. I don’t find it that impressive. The décor is over the top and not that authentic. Some of the props are cool, but not much else. The first is a Trek fan room, not a bridge, and the second is a bridge-like room, not a bridge. It’s more of a Next Generation-inspired media room, not a bridge replica.